on allowing winter its presence. every year it seems that when january rolls around, the christmas decorations are taken down and tucked into boxes for next year. stockings are removed from the mantel, ornaments are replaced in boxes lined with tissue, candles are taken from the windows and placed in storage. homes are left looking stark and bare, empty without the glitz and greenery that once adorned them. as lighter meals are prepared and trips to the gym become more frequent, we find ourselves yearning for spring. for more sunshine, for daffodils and tulips, for jacket-less days. this year, i've decided that i need to make an effort to enjoy winter in all its glory. here in the mid-atlantic, it is with us until april or so, so why not befriend the season? 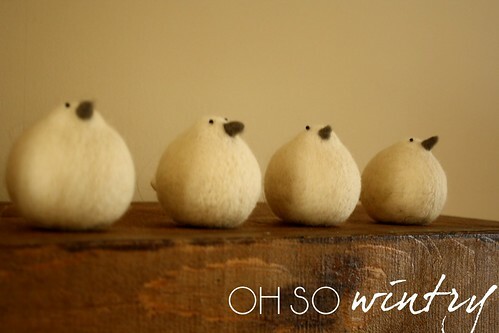 i picked up these little snowbirds at half price during crate & barrel's after-holiday sale. they currently sit on the mantel, along with some glass vessels and simple candles, as a reminder of the beauty of winter. candles continue to burn, and snowmen replace santas in every nook and cranny. i am determined to get the inside jobs done. we are painting and decorating this winter, and will soak up all the fires, warm drinks, and afternoons spent with a book. home will evermore be our haven. i will pull on my boots and button up my wool coat without contempt. i will start my car and scrape the ice with thankfulness that i have such things. i will cheerfully spend time in the kitchen, not with resentment that i am not baking christmas treats, but with a renewed spirit to find more nutritious foods to make. this is my effort. to relish in the simplicity of the season, to contemplate and reevaluate and organize.